Chennai Live 104.8 FM, in association with IndiEarth and Clementine Studios, present The Purple Fest hosted by Ramada Chennai. In an effort to promote Indian indies, The Boardwalk at Ramada will provide a platform for Chennai artists, on the second and last Friday, of the next 3 months. Purple Fest is inspired by the Chennai Live 104.8 FM’s on air segments – Indian Music Hour and Out Of The Box, both of which reserve space specifically for independent music and artists within India. The Fest will provide on-ground space for musicians to play; an extension of the radio station’s on-air platforms. Participating artists have another reason celebrate. Apart from being featured at some of the most exciting nights in Chennai, they walk away with live recordings and high definition video footage courtesy IndiEarth and Clementine Studios. This footage will later be released as part of The IndiEarth Compilation – II. 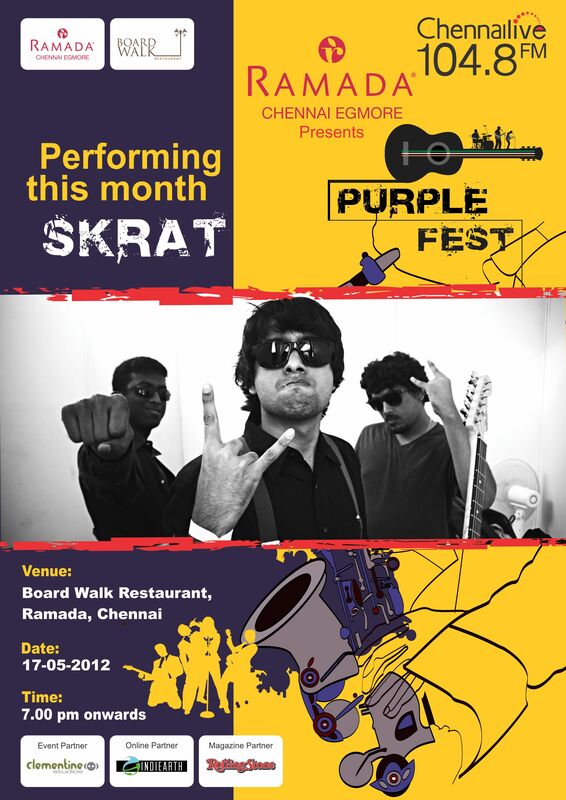 Popular Chennai rockers, Skrat, comprising of TT Sriram, Satish Narayanan and Tapass Naresh, will kick-start this series on the 17th of May 2013. They will be performing tracks from their recently released album, “Bring Out the Big Guns”.